17th April 2019 - the village green application for Rudloe Green was delivered to the Rights of Way department (who also deal with village green matters) at County Hall, Trowbridge yesterday. The application consisted of the 9-page form 44 application countersigned by a local solicitor (thanks Matthew), a 6-page full case with 6 appendices, a list of the 103 people/families who provided evidence of use over the years and the evidence forms/emails themselves - so quite a weighty bundle (but all documents were also provided on CD)! I must admit that I'm not overly optimistic that the application will get across the first hurdle which is its passage through the Wiltshire Council Planning department. In order to proceed, there should not have been a 'trigger event'. This would normally be a planning application on the subject land. In our case, there has been no planning application but, as the reader may know, GreenSquare has, over the years, proposed redevelopment of Rudloe Estate's central island including the building of homes (flats?) on the Green. The ongoing threat of development should not constitute a trigger event but at the Wiltshire Council Cabinet meeting in Salisbury in June 2018, a decision was made regarding the future of Rudloe Community Centre and other Council-owned assets (including the Green) in the central island. That decision was to 'Engage in negotiations with a view to a transfer of the Council's freehold land and property holding to GreenSquare on terms to be agreed, for a regeneration scheme of affordable housing'. This decision might be seen as a trigger event. However, that decision was made by Council Cabinet officers (and unfortunately supported by Councillor Whalley of Corsham) without any consultation with local people. The decision may be seen as unreasonable, ill-advised and invalid for a number of reasons - see below. Firstly, a proposal with business case for the Community Centre was made by Camomile Cafe, a successful Corsham business with year-on-year increasing custom. Camomile Cafe's (CC) business plan was rejected by Wiltshire Council Estates departmental; CC also made an impassioned representation at the Cabinet meeting but to no avail. CC's initiative should have been seen as a valid, positive proposal to enhance the life of the community (5 locals and 2 councillors continue to work on this initiative). Secondly, there is no requirement to increase the density of Rudloe Estate with further 'affordable' housing. The two closest new developments across the Bradford Road, Redcliffe's Park Place with 170 homes and Bellway's Dickens Gate with 88 homes, will include 85 affordable homes (50 at Park Place and 35 at Dickens Gate). Thirdly, in an undated (but possibly 2011) study/paper, the North Wilts Open Space Study, here: http://www.wiltshire.gov.uk/northwiltsopen_space_study.pdf, Rudloe Green is designated as Public Open Space (specifically a Local Park in para 4.41, table 8) within an area, Corsham and Rudloe, “where the deficiencies of Public Open Space are most acute” (para 4.76). Also, the Wiltshire Open Spaces Study 2015 – 2026, which can be found here: http://www.wiltshire.gov.uk/wiltshire-open-space-study-draft.pdf, in section 8.1.3 (Existing provision to be protected), states that the starting point of any policy adopted by the Council should be that all open space should be afforded protection unless it can be proved it is not required. Fourthly, when local people are consulted, it is absolutely clear that the Rudloe Green has been and continues to be a vital part of the life of the estate's residents, particularly for the occupants of the 81 flats who have no garden space of their own. The 103 evidence statements bear witness to this; one example being the words of the Genery family "the Green has been an integral part of our lives". So how could Wiltshire Council's Cabinet (unfortunately supported by Councillor Whalley) possibly come to a conclusion that this part (or any part) of the well-planned Rudloe Estate should be "regenerated" (this of course is a misnomer, a euphemism which actually means that more development will be forced upon Rudloe Estate as it would not be countenanced in other areas like Corsham town or Box village)? As stated above, this decision should be seen as unreasonable, ill-advised and invalid. Anyway, we live in hope regarding the acceptance of the Village Green application which, if accepted, would mean that the Green could never be 'regenerated'. 30th March 2019 and the Rudloe community gathers for a picnic on the Green. Having realised that the Green could (could!) be lost if (if!) the GreenSquare Steering Group (see the 14th March 2019 article below) decides to adopt a plan similar to that proposed in 2015, the residents decided to show how important the Green is in the life of the Estate by holding this first picnic of the year and by completing around a hundred evidence forms on the use of the Green over the past 55 years or so. GreenSquare's 2015 plan for the redevelopment of the central 'island' of Rudloe Estate (above): the Green and the Community Centre are replaced by housing (probably flats); the 1976 housing is demolished and replaced by some further housing (flats?) and a replacement (much smaller) 'green' with, inappropriately, a play park in the middle. A small community centre may be seen (in blue) at centre-left. A shop (in purple) and car park are proposed at the entrance to the estate. Children not picnicking but playing, as they have done here for generations. There are 242 homes (including 81 flats and 34 maisonettes) on Rudloe Estate: the Green is a vital space for the health and wellbeing of the residents. KKK at Rudloe community picnic. KKK? Why Kelly, Kate and Kim of course. Masterchef or what? Just look at Distanza's style. The passion for the Green's continued survival was demonstrated not only by current residents of the Estate but also by former denizens, one of whom undertook a 30-mile pilgrimage across Salisbury Plain to lend support. But I was particularly impressed by a young teenager who had clearly been thinking deeply about what the Green means in the life of the community; at the prompting of her mother she articulated her thoughts to me and others. 14th March 2019 - Rudloe Community Centre and the 'Green'. A group of Rudloe residents along with Camomile Cafe (Corsham) is in the process of trying to form a Community Interest Company (see government link: CICs and the Wiki link: CICs) based at Rudloe Community Centre which remains, at present, in the hands of Wiltshire Council. The Council has come to an interim agreement with the GreenSquare organisation which through a proposed Steering Group is looking into the future of the whole of the central area of Rudloe Estate, including the Community Centre and the 'Green'. The proposed CIC and Village Green (see below) could be seen as an alternative plan to the 'formal' GreenSquare/Steering Group activity. The 'formal' GreenSquare/Steering Group could (note 'could') come to a conclusion that would see the Community Centre demolished and the Green given over to housing. However, the CIC group will endeavour to save the Community Centre and the Green for the community and, through rudloescene, keep locals up-to-date with events. With regard to the Green, there will be a leaflet drop over the weekend 16th/17th March 2019 asking for people's experiences of using the Green over the 55 years since the construction of the Estate. These experiences could be for just short periods at any time in the life of the Estate, from the 60s through to the present day or longer experiences over the whole life of the Estate. And the experiences could be from childhood (for pastimes or playing football or other games) and/or from teenage years through to adulthood (picnics, firework displays etc). The gathering of these experiences is an important first step in trying to gain Village Green status for the Green which would mean that it could never be built on. 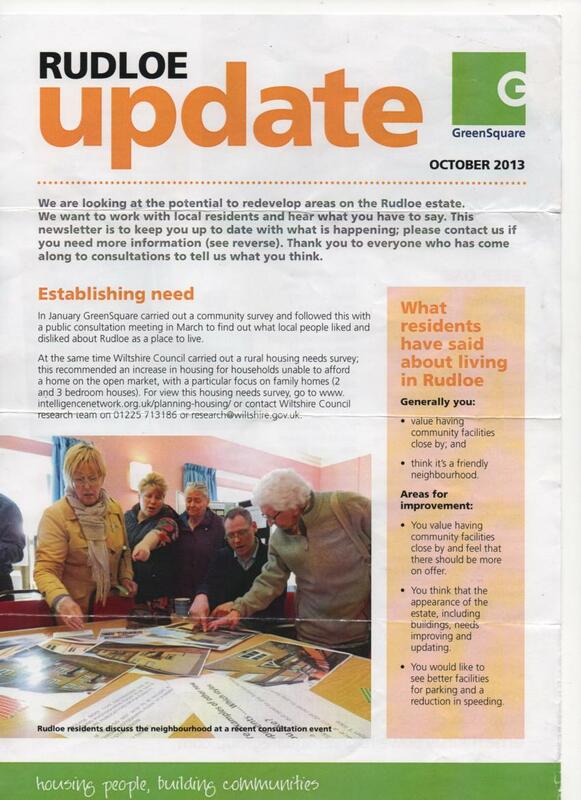 The text of the Rudloe Green leaflet is shown below and is given in .pdf format further below. If the reader wishes to complete a form via this website, please print and complete a form and bring or send it to the address given or send it electronically to rudloe-issues@hotmail.com (this address is also given on the form). Understandably, the reader may have many questions so please feel free to make contact via the 'Contact' page on this website or by email to wirepuller@hotmail.com or by phone to 07803 295291. 23rd September 2018 - the future of Rudloe Social Club and its environs has been placed, by Wiltshire Council, in the hands of a steering group. Councillor Ben Anderson is the 'sponsor' of the Steering Group and Phil Bowley, Strategic Estates Manager of Greensquare Housing Association, is the project manager. The Steering Group will be responsible for producing a proposal for the future of the whole central area between Leylands Road, Priestley Wood Road and Westwood Road. Not too long after this new, unecessary (the old Club was popular, well-used and had a wide variety of spaces for different uses), £850,000 Community Centre was built at the turn of the century it was described as 'not fit for purpose' by the very body (Wiltshire Council) that created it. Wiltshire Council has now 'transferred' the Centre from its books to GreenSquare for the princely sum of £1. This debacle is a local example of the worthlessness of governments and councils whose ignorance is borne of a lack of knowledge (bit of tautology here ref ignorance/lack of knowledge but it emphasises the point!) of the issues on which they pass judgement. Wiltshire Council's Estates team has assessed business plans for the Centre over the past six months and all were rejected. However, if the bids already considered, and others, were taken in combination then this might well provide an ideal opportunity for local groups to continue in operation. The two groups whose bids were rejected (individually) were Rudloe Pre-school and Camomile Cafe (which already has a premises in Corsham and would offer, inter alia, therapy sessions for both young and old which would provide an ideal adjunct to pre-school activities). The third group could be the Magic Dragon pre-school group which has lost its home in Box and is looking for new premises. Anyway, GreenSquare now presides over the future of the central part of Rudloe Estate through the Steering Group which will be further composed of members of Box Parish Council and local (Rudloe) residents. With regard to the Community Centre, the in-combination use by the three groups mentioned above should be one of the first items on the Steering Group's agenda. The proposal put to Cabinet by Councillor Toby Sturgis regarding Rudloe Community Centre was 'To support the recommendation on the preferred option to engage in negotiations with GreenSquare with a view to a transfer to GreenSquare the Council’s freehold interest required for their regeneration scheme within an agreed timescale, potentially at an under-value and on terms to be agreed'. Following representations from councillors Ben Anderson, Brian Matthew, Ruth Hopkinson and Phillip Whalley, the principal of Camomile Cafe (Corsham) and yours truly, the proposal was, effectively, put through 'on the nod' by the Cabinet. Our local councillors, Ben and Brian, put forward positive views and proposals regarding the future of the Centre. I wish I could say the same for Corsham councillors Hopkinson and Whalley who, whilst fighting Corsham development tooth and nail, are happy to throw Rudloe to the wolves. The Camomile Cafe rep (whose name, unfortunately, slips my mind) made an impassioned plea for a social/therapy centre for both young and old. My three-minutesworth can be found in the .pdf file below the photo of the old Club. The meeting agenda and reports can be found in the file link, again below the photograph. The pages of interest on the Rudloe Community Centre are 213 - 228. A well-considered report of the Cabinet meeting, with regard to the Rudloe Community Centre and the traffic issues in Westwood Road and Leafy Lane, from Ben Anderson can be found in the final .pdf file below. 31st July 2017 sees the 'final' closure of Rudloe Community Centre after 75 years. Most of that 75 years was, of course, in the 'old' but successful and well-used social club (shown in the title picture and elsewhere on this website) but 'official' intervention brought about the demolition of the club and the construction of a £1 million white elephant which, just a few years after its construction, was described as "not fit for purpose" by the very body that created it. A lesson from this debacle? Beware of government, whether national or local, and their 'projects'. Billions are wasted on unnecessary and/or unsuccessful projects and the Rudloe Community Centre is a prime, local, example. 'The Village on the Hill' across the By Brook Valley, Colerne, a village of about 3,000 souls supports two pubs (The Fox and Hounds, The Six Bells), two clubs (the Liberal and Conservative clubs), a community centre, two shops and a Post Office. Contrast Rudloe/Hawthorn, a community of similar size, which has lost its shops (Rudloe and Hawthorn), its Post Office and now its community centre (although there is a 'community centre'/cafe in Leafy Lane). So what's the difference? I would say that Colerne is a 'proper' village, one that has grown organically wheras Rudloe, with the demise of the generation that arrived, largely from Ireland, for the war (WWII) work and the continued work at MoD establishments, has lost its soul. Thousands of people but no community. And with the 'official' (again) sanctioning of 700 new homes in west Corsham (Redrow's 150 at Pickwick, Bellway's 100 at Copenacre, Redcliffe's 170 at Bradford Road, Hannick's 88 at Rudloe, Framptons' 180 at ex RAF Rudloe No. 2 site) 'we' will simply be a dormitory conurbation for activities which take place elsewhere. So what now? Our local councillor, Ben Anderson, states "Following a period of informally advertising the Centre, an agent has now been appointed to formally advertise it to potential new users. The Centre will be advertised for ‘All enquiries’ and the current plan is for it to be advertised for up to 6 months. Any organisations interested in leasing or buying the building will be asked to provide a business plan showing how they will viably run the Centre. There is at least one charity currently being spoken to that may bring forward a business plan. Once the outcome of advertising is known, Wiltshire Council will make a decision on which of the options to pursue." Thank you for the link to the story about the demise of the community centre. I have to say I disagree with quite a bit of what you say, and particularly with ‘thousands of people and no community’ claim. Rudloe, as we know, is a late 20th century satellite estate of Corsham, and those who chose to live in Colerne would more than likely never dream of purchasing a house in Rudloe. Furthermore, access to retail facilities of any type from Colerne is pretty difficult and would help to explain the survival of it’s shops. Whilst in contrast, it’s hardly a chore to drive into Corsham from Rudloe. The demographic differences alone would have a bearing on the survival of Colerne’s shops and pubs too. There is a great community in Rudloe with people helping one another out, but crucially not interfering or prying in other’s affairs. It is in fact, the nicest place Sharon and I have ever lived. And as I mentioned to you once before; the contrast between the residents of Rudloe and Neston is quite marked, and I know which I prefer. Despite the fact that Rudloe is still spoken of in disparaging tones by those who live elsewhere. As far as the community centre is concerned, perhaps the usefulness of such an edifice in the community is past it’s sell by date? The digital revolution has transformed the way people occupy their leisure time and perhaps the demographic mix in Rudloe is not interested so much in the facilities on offer. I don’t know enough about use of the centre as it is, though I recall some local people campaigned for the new building at the time. Perhaps the ‘not fit for purpose’ claims back then were spurious and in fact demand for the building was faltering. Oh well I’ve had my pennyworth, please don’t knock the community of Rudloe, they make it a great place to live. 6th February 2017 - the Green Square developments of eleven new homes, eight in Long Close Avenue and three in Sandy Lea Avenue, along with their twenty-two private parking spaces (two for each house) are nearing completion - see the gallery below. Allocating twenty-two spaces for Green Square's new homes is all very well but what about parking for the other Estate residents? The 19th February 2014 and 18th January 2015 articles below propounded that these developments skewed available parking to the advantage of the owners/tenants of these new homes and to the disadvantage of existing residents. This has proved to be the case. When we visit a relative in this area we have to park in the 'main' road (Leylands Road) and block someone's drive. Steve, at no. 70 Leylands had someone block his drive all day some weeks ago and could not get out to go to work. As indicated in the 2014 and 2015 articles, this situation was entirely predictable and unnecessary. This early-60s estate was well-planned by the Council with green space and an eye to the scale of future car ownership. This 'squeezing' of more houses (and people and cars) into the estate is mimicking all late-20th and 21st-century developments and is not the way we should be living. There was a Corsham Area Board meeting on 19th January at which a Box councillor said that Box Parish Council has finally agreed to talk to Wiltshire Council about Rudloe play area. Box Council are now looking at the details of the play area, such as how much it costs to run and replace broken play equipment (although, in fact, there is no broken equipment ... and I never did receive a copy of the putative safety inspection - see 25th October 2016 article below). Box Council hasn't yet agreed to take on the play area but it's a step in the right direction. Storms, teacups! 25th October 2016 - the children's play area is, apparently, threatened with closure following Rudloe's move from Corsham parish to Box parish next April. A leaflet from Ben Anderson has brought this situation to the attention of local residents after his door-to-door drop earlier this week. Clearly Ben has very strong feelings about this as the leaflet production and drop must have taken quite some time and effort. At one of their September meetings Box parish councillors made a vote of some sort (twelve for and one abstention so I am told) regarding the play area and the requirement for Wiltshire Council (which owns the area) to make sure that it is in a good state of repair before Box takes over its maintenance (from Corsham). This seems reasonable and I can't see any reason why Wiltshire Council would not do this. However, this does seem to be a storm in a teacup. Box Parish Council (BPC) has told me that a safety inspection highlighted a number of issues with the area which is now sixteen years old. I have asked BPC to send me a copy of this report as two big kids inspected the area today and found just four minor issues - see the photos below. There are no substantial problems with this play area. Children are at far greater risk of crossing the road to get here than they are from any play area issues. It seems that 'we' continue to fall prey to the 'litigation culture' that has so damaged what we used to know as everyday life. Would you say that the brand new Corsham play area adjacent to the community campus is absolutely safe? Well, our grandson missed his hold on the bar on the zip-wire there, fell to ground and bashed his head. Safety inspection? Claim against the Council? What about the play area on Box Rec - is this up to standard? It is not fenced like the Rudloe area so children could fall prey to any savage dog that might be roaming on the Rec. Fence the play area on the Rec? Put up a sign warning of potential dog attacks? Let us please get a sense of proportion in all this. Fine, request that Wiltshire Council fix the minor problems with the Rudloe play area (which I'm sure they will) but let's not have any melodramas about closing play areas because of minor problems. Simon Henstock has brought your message below to my attention. I am the development manager leading on the Rudloe regeneration project so I can help you with your enquiries – my apologies that it has taken a little while for us to respond to you. We currently have planning permission to develop eight new homes on the garage site off Long Close Avenue and to develop three new homes on the garage site off Sandy Lea Avenue. We're pleased to say that we will be starting on site to build these new properties very soon. They will all be for affordable rent. At present, this is the extent of the activity we have going ahead in Rudloe and we don't currently have firm plans to develop any further beyond these two sites. However, we are keen to invest more in the area, so we will continue to look into how we might be able to regenerate the wider estate. Please be assured that we won’t take forward any plans without first carrying out consultations with local people. If you have any other questions about our plans, please do get in touch. Reference my email of 22nd December 2015 below, are you yet in a position to respond? Greetings from darkest Rudloe. For my sins, I run the rudloescene website which, hopefully, gives local people some insight into the goings-on in our beloved environment. There is a 'News' section on the rudloescene website where such significant proposals should/could be reported but as I can find no mention of the proposals on your website, such reporting would, at present, be solely on the basis of hearsay. Could you point me in the direction of a document or webpage where I may find some substance regarding GreenSquare's plans? Even if no concrete proposals yet exist, I presume that there must be a 'green paper' (pardon the pun) on the subject which locals should know about (rather than being left in the dark). The GreenSquare planning application for eight new homes at Long Close Avenue, Rudloe has been approved by Wiltshire Council planners. This is the 'sister' application to 14/04482/FUL (see 31st December 2014 and 19th February 2014 articles). Whilst these homes will each have two parking spaces, there are no spaces provided for existing residents thus creating a significant parking problem. The rationale, with regard to parking, states that because of the substantial increase in vehicle ownership, there is parking 'misuse' (on the roads) around Long Close Avenue and Kingslea Avenue. GreenSquare's solution? To provide two parking spaces, including a visitor's space (ref Wiltshire Council's Car Parking Strategy of 2011), for its proposed homes. A corollary of this is (of course) to deny parking to existing owners, tenants and their visitors! My wife, sister-in-law and myself regularly visit a house around this location; we used always to park off-road in the garage area. With GreenSquare's already identified parking problems, where does their 'rationale' now propose that we park? Without the garage area, we will have to park in Leylands Road, potentially obstructing buses (and perhaps other large vehicles) that use the Westwood Road/Leylands Road route. As Jim Royle would say "rationale my ****". The 19th February 2014 article discusses the issues associated with increasing housing density at Rudloe. However, in spite of the problems highlighted, Green Square is pushing ahead with its so-called 'Rudloe Renaissance'. This hyperbole is typical of modern life - in this case, glossing over the state of the British housing stock (the smallest in Europe) with slogans. This is not so much a renaissance as a backstreet density increase, stealing the open spaces that 60s planners (in their wisdom) granted necessary for a decent standard of communal life. In March 2013, Wiltshire County Council published its 14-page Rudloe Housing Needs Survey. This document may be found in the file ‘link’ at the foot of this article. The survey’s findings were based on questionnaires delivered to every one of the 565 households in Rudloe. Just 30% of the questionnaires were completed and returned. The conclusion/recommendation of this survey was that ten new subsidised homes and one new sheltered home were needed in Rudloe over the next three years. In 2013, the housing association GreenSquare conducted its own consultations with Rudloe residents on the subject of Rudloe Estate development. 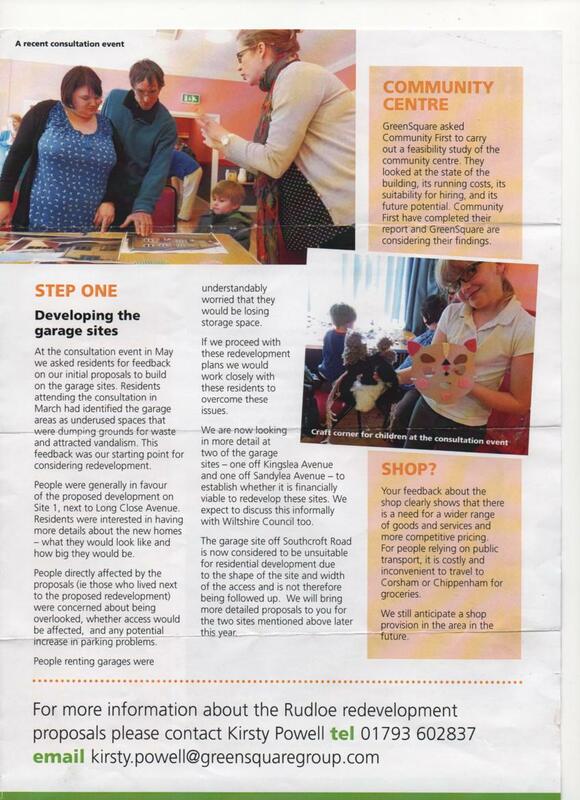 In May 2013, its Rudloe Update (file ‘links’ at the foot of this article) stated that “residents had identified the garage areas as underused spaces that were dumping grounds for waste and attracted vandalism” and “this feedback was our starting point for considering redevelopment”. These statements were presented without evidence. Indeed, local residents have told me that there is no such problem. For example, two residents (names supplied on request) who have lived in houses backing onto the garages for 40 and 50 years have said that the only incidents over all this time had been the odd vehicle ‘dumped’ there – owners could, however, always be traced through a vehicle’s number plate. It appears then that GreenSquare’s “starting point” has been contrived. “Garages underused”? Given the £44 per month rental, it's hardly surprising that residents have chosen to park their vehicles in the roadways. With the impending demolition of garages with just three weeks' notice (which GreenSquare describes as “making things easier”) after 50 years of occupation, Rudloe Estate’s roadways will be more congested and more difficult to negotiate. The occupants of houses in Northcroft Road, Prestley Wood Road and Leylands Road have been able to park their vehicles in and around the garages at the rear of their properties for fifty years. However garage sites, including forecourts and access roads, are GreenSquare property and GreenSquare has informed me that there is no extant permission for any parking in the garage areas. See the result of removing a vehicle from its usual parking spot in the garage area to the only available option, the roadway in front of a Leylands Road house, in the picture above. Buses, emergency vehicles, delivery trucks etc cannot negotiate the roadways. This is called ‘Not thinking things through’. Increasing density and expansion are becoming endemic to west Corsham: Royal Arthur – 221 homes, Copenacre – 120 homes, RAF Rudloe in Westwells Road – 100 homes (estimated), speculative Hannick development – 88 homes, speculative Gladman development – 150 homes, speculative Redcliffe development – 170 homes, Flamingo development – 14 homes, West Point development – 39 homes; a total of over 900 homes if all developments are approved. Most, if not all, of these developments will include a ‘40% social housing’ requirement – so, 360 social homes in west Corsham. Even if just the Hannick development is approved along with Copenacre and RAF Rudloe, Westwells Road, this will provide 300 new homes including 120 ‘social’ homes. And GreenSquare wants to increase the housing density of Rudloe Estate through demolishing garages and building social housing! This is called 'A lack of joined-up thinking'. The Hannick speculative development of 88 houses just across the B3109 from Rudloe Estate, which looks the most likely to be approved (but not if we can help it - three locals will speak at the Wilts CC planning meeting on 12th March), includes about 200 parking spaces. So, on one side of the B3109 we have a proposed development with ample parking and on the other side developments drastically reducing parking. This is called 'Another lack of joined-up thinking'. And, of course, the local academy is in on the act – the Corsham Primary November 2013 News announced: “Many friends and families will know that there are various plans to build new houses in and around Broadwood—most recently we heard some great news that GreenSquare is also planning to build some new family housing on the Rudloe Estate. We have been in discussions with some of the developers and it appears money (called Section 106) is made available to improve the school facilities which is great news for Broadwood”. This organisation appears to have a mercenary interest in all new developments to the extent that it contemptuously and audaciously importunes “discussions with the developers”. Never mind the loss of pastureland, the brownfield/greenfield issue, the lack of services at Rudloe etc - just give us the 106 monies. Sixty years ago, the Rudloe/Boxfields prefab estates had a school, community centre, doctor’s surgery, library, grocer, butcher, fish & chip shop, cobbler and coal merchant. Now, for the 565-home Rudloe estates, just the school, the "not fit for purpose" community centre and a small, very limited convenience store remain. Listen carefully, I will say this only once: “Rudloe does not need or want increased density or greenfield development – it needs and wants services”.